I had some portobellos in the fridge that really needed to be used up so I went in search of some other ingredients to inspire me. I found some spinach, half of a sweet onion, and goat cheese which gave me a good start. I decided to make a quick and simple marinara while I roasted the mushrooms for awhile. I sauteed some fresh spinach with garlic and crushed red pepper flakes for a nice kick then browned some panko crumbs with some garlic, shallot, and butter then coated goat cheese coins with the cooled crumbs. I layered it all together in the roasted mushroom and baked it for a bit. The combination of flavors was outstanding! 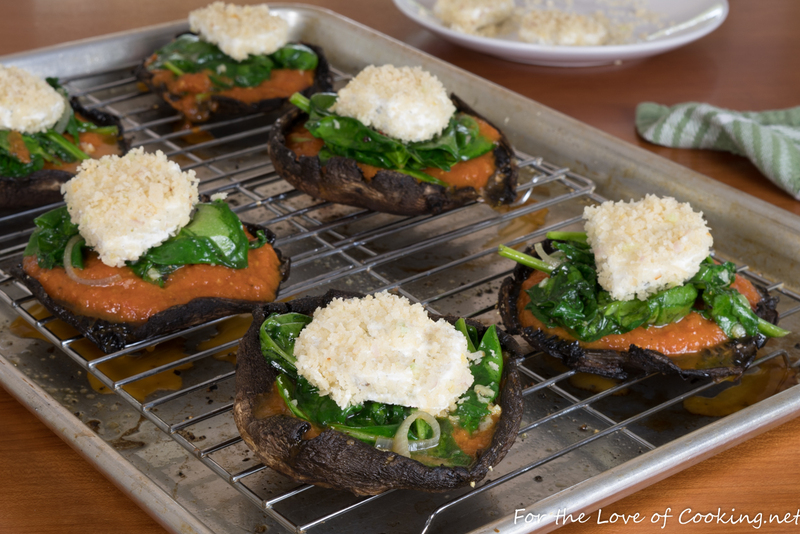 Seriously, we all, kids included, loved these stuffed portobellos with marinara, spinach, and panko crusted goat cheese and thought they made a terrific lunch. I also love that it was a fun recipe to make and it got rid of ingredients that needed to be used up. 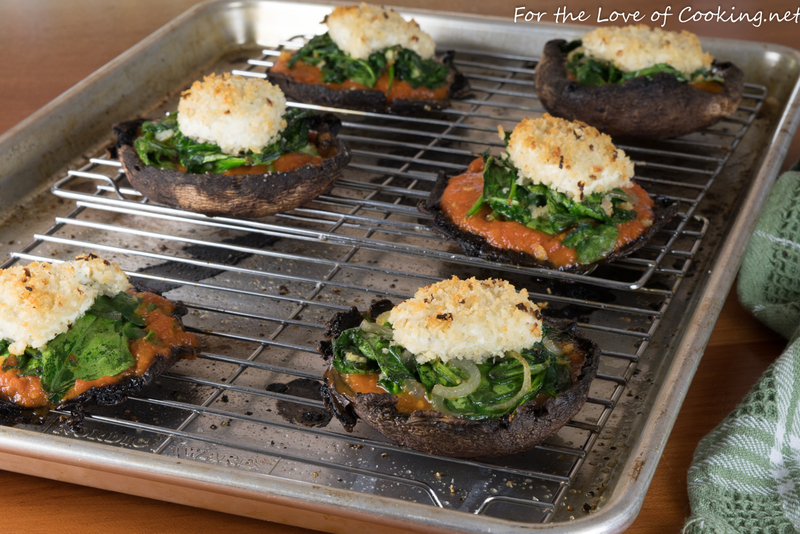 Roast the portobello mushrooms by preheating the oven to 425 degrees. Coat the baking sheet with olive oil cooking spray. Toss the mushrooms in a bowl then drizzle with a tablespoon of olive oil then season with sea salt and freshly cracked pepper, to taste. Rub the oil and seasonings over the mushrooms evenly. Place the mushrooms stem side up on the prepared baking sheet. 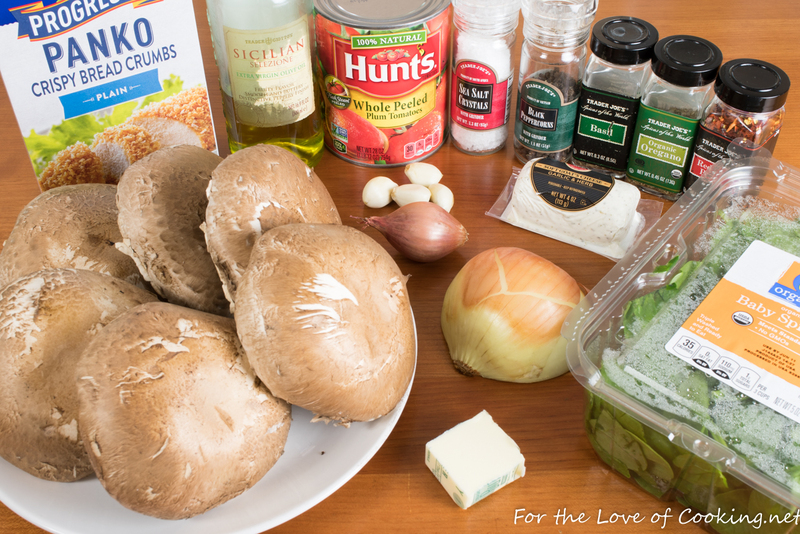 Place into the oven and roast for 20 minutes, remove from the oven to cool, making sure to drain off any liquids from the mushrooms and on the baking sheet immediately. Place wire racks (cooling racks) in the baking sheet then place the roasted mushrooms on top of the wire racks. This will help prevent the mushrooms from getting soggy when they bake later. Make the marinara while the mushrooms are roasting by heating a tablespoon of olive oil in a small Dutch oven over medium heat. Add the onion and cook, stirring often, for 3-4 minutes. Add the minced garlic, dried basil, dried oregano, and pinch of crushed red pepper flakes then cook, stirring constantly, for 1 minute. Add the can of whole tomatoes to the Dutch oven and crush the tomatoes with the stirring spoon. Bring up to a simmer then reduce heat and cover with a lid for 20-30 minutes, stirring occasionally. Remove from heat then blend the mixture using an immersion blender then taste and season with sea salt and freshly cracked pepper, to taste; set aside until needed. Make the garlicky panko crumbs by heating the butter over medium heat in a small skillet. Add the shallot and cook, stirring often, for 2 minutes. Add the garlic and panko crumbs then cook, stirring constantly, for a few minutes until the crumbs are just lightly golden. 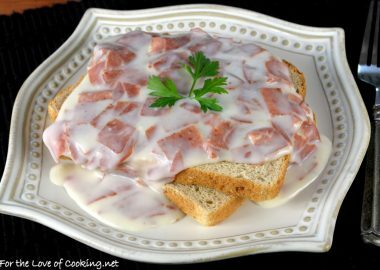 Remove from heat and pour into a small bowl. Set aside to completely cool before coating the goat cheese. Season with sea salt and freshly cracked pepper, to taste. 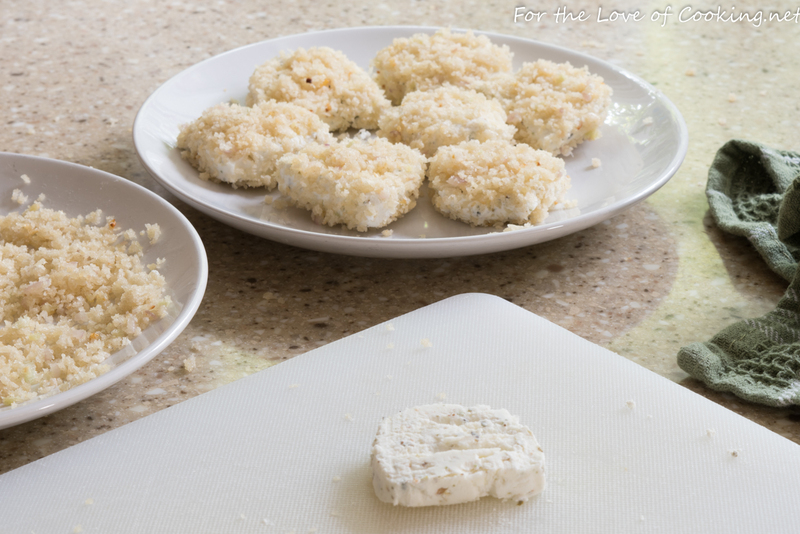 Coat the goat cheese with the panko crumbs by carefully slicing the cheese into like size coins. Carefully press the coins in the cooled panko crumbs completely on both sides. Place on a plate until needed. Sauté the spinach by heating half of a tablespoon of olive oil in a large skillet. Add the shallot and cook, stirring often, for 2 minutes. Add the minced garlic, and cook, stirring constantly, for 30 seconds. Add the spinach and a pinch of crushed red pepper flakes then cook, stirring constantly, for 1-2 minutes, or until spinach is just starting to wilt. Remove from heat and season with sea salt and freshly cracked pepper, to taste. 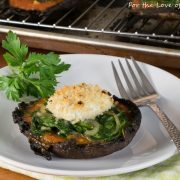 Prepare the stuffed mushrooms by spooning some marinara into each mushroom, followed by a spoonful of the sauteed spinach, then top with a panko crusted goat cheese coin. Place into the oven and bake for 15-20 minutes until hot and the crumbs are starting to turn golden brown. Remove and serve immediately. Enjoy! Sea salt and freshly cracked pepper to taste. 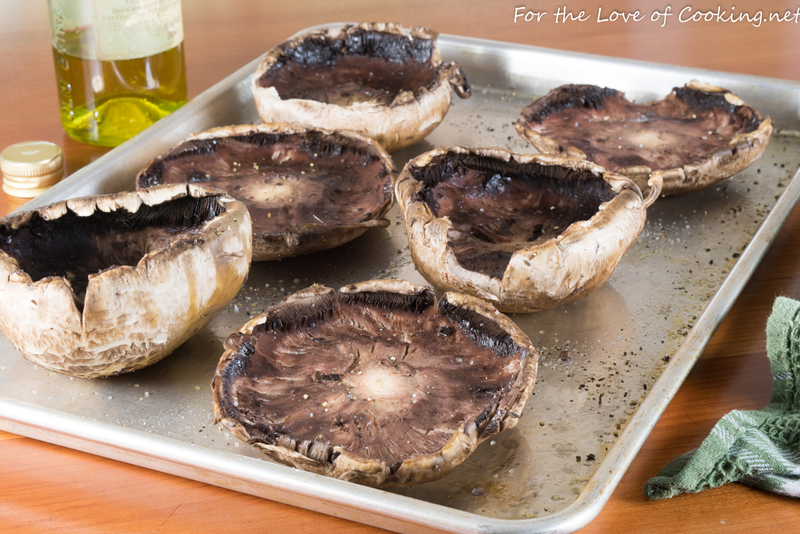 Roast the portobello mushrooms by preheating the oven to 425 degrees. Coat the baking sheet with olive oil cooking spray. Toss the mushrooms in a bowl then drizzle with a tablespoon of olive oil then season with sea salt and freshly cracked pepper, to taste. Rub the oil and seasonings over the mushrooms evenly. Place the mushrooms stem side up on the prepared baking sheet. 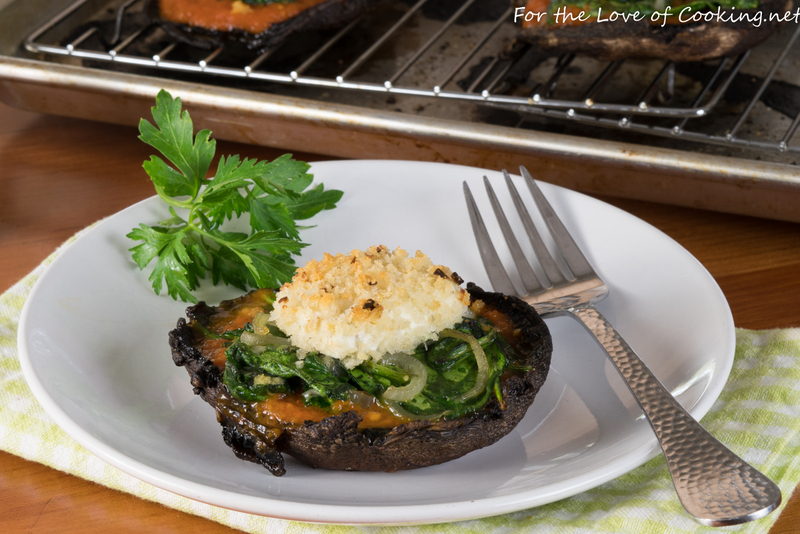 Place into the oven and roast for 20 minutes, remove from the oven to cool, making sure to drain off any liquids from the mushrooms and on the baking sheet immediately. Place wire racks (cooling racks) in the baking sheet then place the roasted mushrooms on top of the wire racks. This will help prevent the mushrooms from getting soggy when they bake later. Make the marinara while the mushrooms are roasting by heating a tablespoon of olive oil in a small Dutch oven over medium heat. Add the onion and cook, stirring often, for 3-4 minutes. Add the minced garlic, dried basil, dried oregano, and pinch of crushed red pepper flakes then cook, stirring constantly, for 1 minute. Add the can of whole tomatoes to the Dutch oven and crush the tomatoes with the stirring spoon. Bring up to a simmer then reduce heat and cover with a lid for 20-30 minutes, stirring occasionally. Remove from heat then blend the mixture using an immersion blender then taste and season with sea salt and freshly cracked pepper, to taste; set aside until needed. Make the garlicky panko crumbs by heating the butter over medium heat in a small skillet. Add the shallot and cook, stirring often, for 2 minutes. Add the garlic and panko crumbs then cook, stirring constantly, for a few minutes until the crumbs are just lightly golden. Season with sea salt and freshly cracked pepper, to taste. Set aside to completely cool before coating the goat cheese. Coat the goat cheese with the panko crumbs by carefully slicing the cheese into like size coins. Carefully press the coins in the cooled panko crumbs completely on both sides. Place on a plate until needed. Sauté the spinach by heating half of a tablespoon of olive oil in a large skillet. Add the minced garlic, and cook, stirring constantly, for 30 seconds. Add the spinach and a pinch of crushed red pepper flakes then cook, stirring constantly, for 1-2 minutes, or until spinach is just starting to wilt. Remove from heat and season with sea salt and freshly cracked pepper, to taste. Place into the oven and bake for 15-20 minutes until hot and the crumbs are starting to turn golden brown. How very delicious and moreish! These look very good Pam – I can’t remember the last time we had portabella’s. What a great idea. Stuffed Portabella taken up a few notches. How much spinach? It’s not listed in the recipe. The recipe looks incredible. Sorry! I have corrected the recipe. I used 5 oz of fresh baby spinach. I love that this amazing meal was basically made from leftovers from your fridge!